Published on Thursday, March 26, 2015. In early March, the American Craft Council and The Balvenie, makers of the handcrafted single malt Scotch whisky again joined together in recognition of the finalists and the recipient of the 2015 American Craft Council Rare Craft Fellowship Award in association with The Balvenie. In a presentation hosted by The Balvenie in New York City, the 2015 American Craft Council Rare Craft Fellowship Award was presented to bladesmith Bob Kramer of Olympia, Washington. Finalists for the award were blacksmith Elizabeth Brim (Penland, North Carolina), potter Mark Hewitt (Pittsboro, North Carolina), and basketweaver Mary Jackson (Charleston, South Carolina). 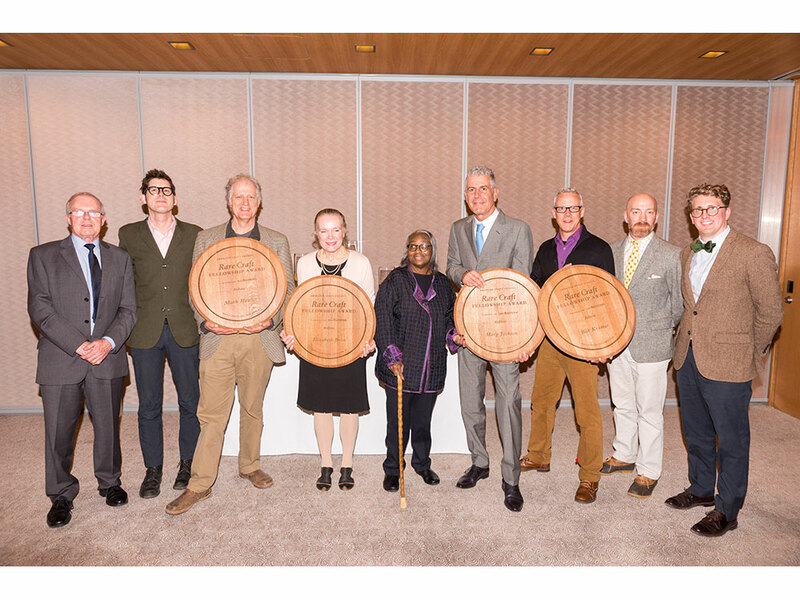 At a luncheon held in their honor, the artists were joined by the jurors for the 2015 award, including chef, author, and raconteur Anthony Bourdain as lead juror, The Balvenie’s malt master David Stewart, ACC’s director of education Perry A. Price, Arizona State University Art Museum curator of ceramics Garth Johnson, and digital librarian and writer of 10engines.com, James Fox. Congratulations to our 2015 fellow and finalists. Enjoy these short films to learn more about the artists and their work. The American Craft Council Rare Craft Fellowship Award is presented in recognition and support of contributions to the maintenance and revival of traditional or rare crafts in America. Fellow Bob Kramer will receive an exclusive trip to Scotland and a $10,000 endowment toward his work. The finalists each received a $5,000 endowment. Nominations for the annual award are accepted by the Council. For more information, read the full press release. Step by step, master knifemaker Bob Kramer found his life’s work.